It is always a pleasure for the President of CEPI to sign certificates destined for estate agent/property manager graduates of establishments which have been awarded the label CEPI.eur. 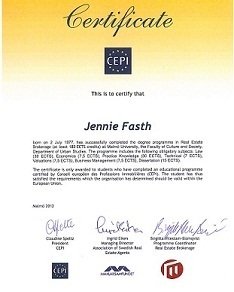 This CEPI label represents recognition of the successful completion of a training programme, called “Eureduc”. The "Eureduc" programme includes minimum criteria established by CEPI, and respecting also a training programme comparable between universities, higher educational colleges and professional schools which subscribe to it. More than fifty European training establishments, amongst them the Malmõ Hõgskola, provide training based on the training criteria adopted by CEPI in 2000 and modified in 2002. A dozen formalise the programme with a certificate knowing that, based on evidence, the young graduates will one day be confronted with the requirements of cross-border transactions and seek to develop a network of professional contacts in other countries of the European Union. In this way the certificate represents the knowledge acquired, but is also a means to communicate and network with other young professionals, and therefore an invitation to enlarge work prospects. CEPI is currently working on a revision of the training criteria known as “Eureduc” whilst focusing on what has been learnt rather than on the training programmes. The result of the work is a European competence profile. This is almost finished as concerns estate agents and has been developed with the Confédération européene de l’Immobilier (CEI), and will very soon be discussed with the “Eureduc” partners. The objective of this revision is to permit professionals who have followed an academic or professional training programme, but also those persons having benefited from informal or non formal learning, to better position themselves with respect to the main concern of the client and the consumer, that of defining the tasks to be carried out and the quality of service rendered. We profit from this occasion to congratulate those students who will be starting out in a property profession and to thank the association Maklärsamfundet and the Malmõ Hõgskola for their involvement and support. Click here to read more about the "Eureduc" programme.